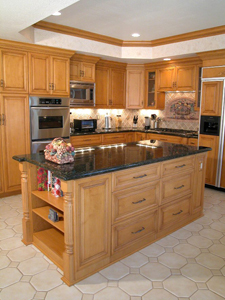 If your current kitchen design is cramped and outdated, let Reborn Remodeling Solutions give you a fresh start. We are a full-service remodeling contractor – licensed, bonded, and insured in the state of California – specializing in cabinetry, kitchen remodeling, bathroom remodeling, and more. Since 1983, we have transformed thousands upon thousands of kitchens across southern California into dream kitchens for homeowners just like you. We pay attention to every little detail, and we strive to make sure that everything is just the way you want it to be. All backed by a 25-year warranty! Reborn Remodeling Solutions Cabinets is a family-owned and -operated company providing you with The Ultimate Remodeling Experience®. Whether you’re looking for our Vianvi Signature® Cabinet Refacing for your kitchen cabinets, or a complete kitchen remodel with custom-built new kitchen cabinetry, there’s no job too big or too small for us. From beautiful sinks, new lighting, and custom backsplashes to granite countertops and tile floors installed just to your liking, we will handle all of your kitchen design modifications with great precision and the utmost care. And, we even offer financing options for homeowners, so that vision you call your dream kitchen can be the true focal point of your home that you always wanted. If a new kitchen design from Reborn Remodeling Solutions catches your eye, contact us at 1-877-371-4943 or stop by our showroom in Anaheim today. We are open seven days a week, and we would love to walk you through and show you examples of just how amazing your kitchen in Yorba Linda, Huntington Beach, Mission Viejo, Brea, Orange County, Placentia, Laguna Niguel, Fountain Valley, Santa Ana, or any nearby community could look. "Michael Armstrong was great! Not only was he very professional he was also extremely personable."